For the book, see World of Warcraft: Illidan. For the Black Temple encounter, see Illidan Stormrage (tactics). For other usages, see Illidan (disambiguation). Illidan Stormrage is the first of the demon hunters, the former self-proclaimed Lord of Outland, former ruler of the Black Temple, and the original leader of the Illidari. He is the twin brother of Malfurion Stormrage and was, like his sibling, in love with Tyrande Whisperwind. Though born a night elf and renowned as a powerful sorcerer, Illidan officially betrayed his people as he temporarily sided with the demonic Burning Legion during the War of the Ancients, though his reasons for doing so were noble as he secretly aimed to repel the Legion's invasion. Due to this betrayal, as well as having secretly created a second Well of Eternity after the first one was destroyed at the end of the war, he was dubbed "the Betrayer" and imprisoned in the Barrow Deeps below Mount Hyjal. There, Illidan remained for over 10,000 years, watched over by the warden Maiev Shadowsong and her Watchers. During the Third War and the Legion's second invasion of Azeroth, Illidan was freed from his prison by Tyrande, who believed that he would be a valuable ally in the conflict. However, before battling the dreadlord Tichondrius, Illidan consumed the fel energies of the Skull of Gul'dan, and became a demon. He was therefore banished by Malfurion, despite having succeeded in defeating a high-ranking member of the Legion. After the demons were defeated at the end of the war, Illidan was approached by the demon lord Kil'jaeden, who ordered the Betrayer to destroy Kil'jaeden's traitorous creation, the Lich King. Amassing an army of servants in the form of the naga led by Lady Vashj, Illidan attempted to use the artifact known as the Eye of Sargeras to destroy the Lich King's stronghold of Icecrown, but was hindered by Malfurion, Tyrande and Maiev. Upon hearing that Tyrande was under attack by the undead Scourge, the demon hunter abruptly abandoned his mission and instead temporarily joined forces with his brother in order to save the woman they both loved. Knowing that this would earn the ire of Kil'jaeden, Illidan thereafter fled with his naga to the shattered realm of Outland, where he was later joined by new allies: the blood elves led by Kael'thas Sunstrider and the Broken draenei led by Akama. Together with his servants, Illidan managed to overthrow the tyrannical ruler of Outland, the pit lord Magtheridon, and claim the demon's stronghold and army for himself. Moments later, however, Kil'jaeden appeared once again to remind Illidan of his task. After journeying to Icecrown, Illidan's efforts were ultimately stopped by the Lich King's champion, Arthas Menethil, who nearly killed the demon hunter in a fateful duel outside the entrance to the Lich King's chamber. Having survived his brush with death, Illidan retreated once more to Outland to muster his forces and prepare for his new plan: to destroy the Burning Legion and the demon world of Argus. Despite succeeding in destroying the Legion stronghold of Nathreza, the Betrayer was ultimately cornered and struck down within his own sanctum by Akama, a group of adventurers of Azeroth and his vengeful former jailer, Maiev. However, even in death, Illidan's story was not yet complete: after the fateful confrontation, Maiev secretly brought the demon's corpse to the Vault of the Wardens so that his spirit could suffer the rest of his eternal sentence. There it remained for years, until finally, the Legion invaded once more. Illidan was introduced in Warcraft III: Reign of Chaos, though he played a far more significant role in the game's sequel, The Frozen Throne. He made his first appearance in World of Warcraft with the first expansion, The Burning Crusade, serving as the final boss of the Black Temple raid in patch 2.1. Illidan returns in World of Warcraft: Legion alongside his Illidari. He becomes a primary force towards defeating the Legion, siding with the heroes of Azeroth. Illidan and his twin brother, Malfurion, were born at Lorlathil in Val'sharah and grew up in Suramar as friends with Tyrande Whisperwind. Illidan practiced Highborne magic. In his youth he attempted to master the druidic forces, as his brother had, but the sorcery called to him in a way that the magic of the land did not. Unlike his brother, Illidan was born with amber eyes, at the time a sign of a great destiny — however, this actually indicated inherent druidic potential. When Malfurion and Tyrande had found their destiny, Illidan was still searching for his. Though not a Highborne himself, he became the personal caster of the military leader, Kur'talos Ravencrest. Illidan as he appeared during the War of the Ancients, over 10,000 years ago. Cenarius instructs Malfurion, Tyrande, and Illidan. A young Illidan casting a spell, before he lost his eyes. Illidan during the War of the Ancients, before he lost his eyes. When Archimonde's invasion of Azeroth had begun and Azshara's treachery became known, Malfurion convinced Illidan to leave his queen. Illidan followed his brother. But as Cenarius and the dragons entered the battle, Malfurion came to understand that their adversaries were too powerful to fall in combat. To end the invasion, he plotted the destruction of the Well of Eternity. The idea appalled Illidan. The Well was the source of his magic — and likely of the elves' immortality — and its loss was a price far too dear for him to pay. In addition, the night elf found that he increasingly admired the powers of the Burning Legion, seeing a magical purity that underlay their chaotic behavior. Where the night elves struggled to maintain their ground, the Burning Legion's numbers did not seem to permanently diminish. After the death of Latosius, Illidan became the leader of the Moon Guard. However, Illidan did not use the Moon Guard to their fullest potential. Instead of having them cast spells, he ordered them to transfer their power into him, thus empowering his own spells instead; but in doing so, this opened them to attack from the demons with no means to defend themselves. After one particular battle defending Black Rook Hold, where he drained his own soldiers to the point that they died, Illidan realized that sacrifice was necessary to defeat the Burning Legion, and the others were fools for not seeing it. Illidan had strong feelings for Tyrande Whisperwind, a novice priestess in the Sisters of Elune. Illidan so desired to impress Tyrande that he often acted without thinking, particularly in magic; he never realized that these displays weren't quite what the priestess was looking for in a mate. But while Illidan struggled to win her heart, none of them realized that the battle was over soon after it had begun; Tyrande had chosen Malfurion almost from the beginning. Xavius knew of this and used his power to darken Illidan's thoughts, convincing him that if Malfurion were to die, Illidan would no longer have a rival for Tyrande's love. Finally the sight of Tyrande in the arms of his brother shattered his final ties to the defenders. It was likely somewhere in this point of time that Illidan defeated a doomguard commander named Azzinoth and took up the demon's personal weapons as his own; these would become known as the Warglaives of Azzinoth. When Illidan left, Kur'talos's daughter Illysanna - distraught over her father's death and convinced Illidan's path was right - left to go find him and walk in his footsteps. Sargeras burning out Illidan's eyes. Illidan, with a new plan spurred into his mind, journeyed to Zin-Azshari. There he feigned allegiance to Azshara and Mannoroth. Illidan's plan was to obtain the Demon Soul, an artifact of great power created by Deathwing also known as Neltharion the Earth-Warder, which had the ability to close the portal which was allowing the demons to enter Kalimdor. However, to put this plan in action, Illidan had to gain more power. Illidan was eventually brought before Sargeras himself, who quickly discovered the night elf's plan to obtain the Demon Soul for the Legion. Sargeras was pleased with this plan, and gave Illidan a "gift" in return for his allegiance. Illidan's eyes were burned out by Sargeras himself, despite still being beyond the portal, and orbs of mystic fire set in their place that allowed Illidan to see all forms of magic, and fel tattoos covered his body. When Illidan's eyes were burned out, he also received a vision of the true strength of the Legion and their crusade across infinite universes, and he came to realize that defeating them on Azeroth would mean nothing. He resolved then to find a way to defeat them for good. Azshara was fascinated by the "new" Illidan (who was wary of her advances), but remained cautious, sending Captain Varo'then to accompany Illidan in his search for the Demon Soul. When the Demon Soul came into the hands of the Legion, they went about using it as a focus to strengthen their portal above the Well of Eternity for Sargeras. Illidan reunited with the Kaldorei Resistance, which now greatly mistrusted him after seeming to betray them and hand over the key to victory to the demons. But working alongside Malfurion, the brothers worked together to close the portal with the Demon Soul's power. The destruction of the portal caused the Well of Eternity itself to grow unstable, and right before the defenders fled Zin-Azshari Illidan took several vials and filled them with water from the Well of Eternity. The Great Sundering that resulted from the Well's instability split the main supercontinent of Kalimdor into various smaller continents. After the Great Sundering, Illidan scaled the peaks of Mount Hyjal, where he found a small, tranquil lake. There he poured the contents of three of the vials into the waters. The chaotic energies quickly manifested, tainting the lake and twisting it into a new Well of Eternity. Illidan's joy was short-lived however, when his brother, Malfurion, Tyrande and the rest of the kaldorei leadership discovered him - and all were horrified at what he'd done. Unable to accept that his brother had committed such treachery, Malfurion tried again to explain to Illidan the folly of his ways. The magic, he insisted, was chaotic by nature, and it could only bring about destruction so long as it existed. Illidan refused to listen, so enraptured by the magic's power that his brother seemed to him an unknowing fool. Illidan claimed that magic would be needed should the Burning Legion ever return. The lack of remorse shook Malfurion to his core and he raged at his brother, understanding now that Illidan was lost forever to the magic's sway. He ordered him imprisoned deep below Hyjal in a jail kept far from sight and mind. Malfurion would later note that sometimes he went to visit Illidan in his prison in the hopes of turning him from his fatal path. Illidan in Warcraft III: Reign of Chaos. Illidan languished for 10,000 years in a lightless prison. Califax, a keeper of the grove, and a contingent of night elves (including Maiev Shadowsong) kept constant guard over the Betrayer. Release came at the unexpected hands of Tyrande, who slaughtered the night elf guards in the hopes of using Illidan against the Legion, which had returned to Azeroth at the hands of the Scourge. With his love for Tyrande undampened through the millennia of confinement, Illidan agreed to help. He swore to throw back the Legion and to depart from the night elves forever. Upon being released, Illidan stormed Hyjal's war-torn forest. Malfurion opposed Tyrande's decision, thinking the release of Illidan a catastrophic mistake. Frustrated that his brother remained unchanged and eager to prove to him that the demons had no hold over him, Illidan left Malfurion behind, leading a force of night elves into Felwood to hunt down the Legion. While in Felwood, he encountered Arthas, champion of the Lich King, and they engaged in combat. The fighters were equally matched, and the combatants reached an impasse. Illidan stopped the duel and demanded to know why Arthas had tracked him. Arthas responded openly, telling Illidan about the Skull of Gul'dan, the demonic artifact that had corrupted Felwood. He explained that if the artifact were destroyed, the corruption of the forests would halt. To ensure that Illidan would take the bait, Arthas spared no detail of the Skull's power, adding that his master knew of Illidan's thirst for power. Although Illidan did not trust Arthas, he nevertheless sought the Skull and its power out. A great Demon Gate defended the Skull as Illidan and his forces had to fight mightily to gain access to the artifact. Driven by necessity and influenced by the belief that with the increased power, he could at last redeem himself in the eyes of Tyrande, he shattered the demonic seal and used the Skull's powers for his own. Strength he found, but peril greater than power came to him at once. The battle for control of the Skull came with a heavy price and the artifact's powers changed him. Transformed into a demon, Illidan wrapped himself in shadow and utterly destroyed Tichondrius and his forces. But with victory came devastation. Tyrande and Malfurion sensed the demonic power lurking within Illidan and turned away with disgust and despair. Malfurion chastised his brother, convinced that Illidan had traded his soul for more power. Enraged, Malfurion banished his brother from the forests. Feeling his sacrifice and effort were unappreciated, Illidan muttered "So be it... brother", and left the night elf lands. Illidan absorbed the Skull of Gul'dan. Illidan became a demon after consuming the power of the Skull of Gul'dan. Illidan, after absorbing the Skull of Gul'dan. Illidan calling the naga from the depths of the sea. Kil'jaeden meets with Illidan, a few months after the Legion's defeat at Mount Hyjal and Archimonde's death. After the Legion's defeat, Illidan was visited by Kil'jaeden, who, while noting Illidan's sketchy track record with the Legion, offered him one final chance to serve them. He told him to seek out the Frozen Throne, and destroy it. Ner'zhul had grown far too powerful for Kil'jaeden to control and betrayed him, and Illidan was to remove him from the equation; in exchange for more power and magic than he could dream of. He granted him the Orb of Kil'jaeden to aid him in this task. By harnessing Gul'dan's enchanted skull, Illidan came to possess the warlock's memories, and a plan came to mind, but he would need allies to help him. He decided to enlist the aid of old friends. Illidan had heard only rumors of the Highborne's fate. Illidan cast a powerful spell and called the naga to the surface, calling in some old Highborne debts. A group of naga led by Lady Vashj emerged from the depths and pledged themselves to him. They did not come because of their shared history, nor did they respect his demonic power. They came because the Old Gods willed it. They noticed Illidan and his hunger for power. They sent the naga to aid Illidan in his campaign against the Lich King so that it could spark a new war. If the former night elf became troublesome, the Old Gods could simply command the naga to cut out his fel-corrupted heart. Thus, Vashj came to lead those who would be known as "Illidan's Naga". But Illidan still had the troublesome warden, Maiev Shadowsong, to deal with, as she had persistently chased him all over Kalimdor. Illidan then allied with a group of satyrs, known as Illidan's Servitors, and corrupted some furbolgs. Then he ran to the port of Nendis with his naga and satyr minions protecting the way up behind him. Maiev killed the furbolgs and defeated his forces, but when she came to the port, Illidan hijacked a boat and set sail, while a cadre of naga stayed behind to scuttle the ships and ruin all hopes of following him. With the naga swimming in his wake, Illidan came ashore on the Broken Isles — the ruined remains of Suramar (ironically, the same city where Illidan grew up) which Gul'dan and his warlocks had raised twenty years before, and the home of the Tomb of Sargeras. Illidan portrait in Warcraft III: The Frozen Throne. Illidan after receiving the Orb of Kil'jaeden. But Illidan's servants had not been successful in destroying the boats. Maiev and the Watchers arrived on the Broken Isles shortly after Illidan, and the two forces battled across the watery terrain. Illidan reached the tomb, and Maiev was quick to follow. With Gul'dan's knowledge, Illidan quickly traversed the Tomb and came to the chamber which contained the Eye of Sargeras. Maiev came upon him as he and Vashj were activating the powerful artifact, and, as vengeance for her imprisoning him for 10,000 years, Illidan used the Eye to bring the Tomb down around her, and then quickly escaped through the underwater passages used by the naga. Though he killed Naisha and all the other Watchers within the Tomb, Maiev escaped with her magical abilities. On the surface, Illidan and Maiev battled for supremacy as the Warden sent out a runner to gather reinforcements from Ashenvale. Malfurion and Tyrande arrived on the Broken Isles with reinforcements as Maiev's base was being overrun. When they struck back, Illidan's forces crumbled, but he and his retainers fled before they were seriously harmed. Tyrande pursued them out of the base, and Illidan ensnared her to protect himself, and then warned her not to interfere. He fled across the sea once again. During this battle, Tyrande finally revealed why she had spurned Illidan: too drunk with his rising magical and political power, he had forgotten his own inner strength. Malfurion, despite his increases in power, held on to that strength within him. Armed with this knowledge, Illidan finally came to grips with his feelings. Illidan landed on the shore of Lordaeron, and quickly made his way through the Silverpine Forest to get to Dalaran, where Illidan began to use the Eye of Sargeras to break apart the polar ice cap and destroy Icecrown and the Frozen Throne. But he was interrupted by Maiev and Malfurion, and the spell failed. Malfurion had felt Illidan's spell tearing the land apart and concluded that he was a danger to the world and had to be stopped. Illidan, who was entangled by his brother, called Malfurion a fool as he was destroying the Lich King, their common enemy. Malfurion was furious at him for causing the loss of Tyrande, who had been, according to Maiev, killed. Illidan was heartbroken that the woman he loved was dead, but Prince Kael'thas, the night elves' newest ally, thought that perhaps it was premature to presume her dead. Kael'thas explained that Tyrande had not been "torn apart" by the undead, as Maiev had told Malfurion, but had instead fallen into a river and been swept away by the currents. Malfurion immediately arrested the Warden and promptly went in search of Tyrande. Illidan begged to be allowed to help his brother track down the beloved priestess. Illidan and his personal guard of naga found Tyrande under heavy attack from a massive undead force. Illidan and his naga battled their way through the undead until they reached her. Tyrande was taken aback by Illidan's service to her, and when he delivered her safely to Malfurion, she was astonished. Malfurion told Illidan he was free to go on the condition that he never threaten the night elves again. Illidan, wishing for an end to the conflict with his brother, agreed. Illidan in Warcraft III: The Frozen Throne. Illidan, Akama, Vashj, and Kael'thas battle Magtheridon. After Malfurion let him go, Illidan created a portal to Outland by using a small rift left behind from the portal Kel'Thuzad had used to summon Archimonde into Azeroth. He fled immediately, being pursued by Maiev. Now that he had failed to destroy Ner'zhul, he knew that Kil'jaeden's wrath would not spare him, so Illidan wanted to find a world where he could remain unmolested. He felt that Outland, the ruined remains of Draenor, was just such a place. Illidan was chased down on the shattered world until he was captured by Maiev and the Watchers, and imprisoned once again. But he was saved by Kael'thas Sunstrider and Vashj. Illidan promised Kael a way sate his people's magical addiction and in return, Kael pledged his people's allegiance to him. Illidan accepted the allegiance of the blood elves, and made Kael his second-in-command. The Sin'dorei, coupled with the naga, would be very invaluable to his plans. Illidan continued his original plan - to rid Outland of demonic influence so that he could stay out of Kil'jaeden's grasp. To do this, they laid siege to the Black Temple of Magtheridon, the Pit Lord who had taken control of the world. But first, Illidan systematically shut down his dimensional gates to stem the flow of reinforcements. Eventually, they succeeded. When they came to the Black Temple, Illidan was approached by Akama of the Broken, who pledged the allegiance of his race. Akama's broken felt indebted to Illidan and his army for aiding them in their fight against the fel orcs of Magtheridon, who had laid siege to their village with the intent of slaughtering them all. They laid siege to the Black Temple and destroyed Magtheridon's defenses, and then defeated the Pit Lord in battle himself. Magtheridon noted wryly that Illidan had great power, and asked if the Legion had sent him as a test. Illidan laughed, saying that he was not a test, but a replacement, and imprisoned Magtheridon beneath Hellfire Citadel and kept sealed in place by the fel orc jailor Keli'dan the Breaker. As Illidan rallied the forces of Outland under a new banner, a storm of fire and smoke descended upon the Black Temple, and Kil'jaeden appeared in all his unholy glory. Chastising Illidan for his foolhardy attempts to flee his wrath, Illidan quickly claimed that he had been gathering his forces for a second attack on the Frozen Throne. Kil'jaeden, seeing that Illidan's new comrades "showed some promise", agreed to give Illidan one more chance to appease the demons. Kil'jaeden did not realize Illidan's capture of the Black Temple was an act against the Legion itself. Demons were conniving creatures that were known to betray each other for greater power. Kil'jaeden thought Illidan to be his servant that had claimed Outland as a personal prize, which Kil'jaeden would allow him to keep if Illidan destroyed the Lich King. However, if Illidan refused, Kil'jaeden threatened to do everything in his power to retake the broken world from Illidan and destroy him. Illidan feigned his thoughts and allegiance before Kil'jaeden once more and agreed to destroy the Lich King. He used one of the many portals on Outland, and crafted a new gateway back to Azeroth. He took a portion of his army, leaving Akama to secure Outland, arrived to Northrend and began marching on Icecrown Citadel. Illidan, Vashj, and Kael laid siege to Northrend and battled Anub'arak's forces as they trudged through the snow towards the Icecrown glacier. But Ner'zhul, knowing he would be overrun if he didn't do something, called Arthas to Northrend to complete the plan he had set in motion so many months before. Finally, Illidan's forces arrived at Icecrown as Arthas and Anub'arak dug their way out of Azjol-Nerub, and the two factions squared off in a titanic battle as they tried to gain control of the four mystical obelisks surrounding the glacier. After a long battle, and control going back and forth between the two enemies, Arthas activated all obelisks, and the doors to the Frozen Throne were opened. But Illidan was not finished yet. Meeting Arthas at the glacier's base, the two warriors engaged in single combat. After a few minutes of exchanging blows, however, Arthas overcame Illidan's defenses and cut him down. Illidan fell in the snow, badly wounded. Rather than finish him off, Arthas, before taking his leave, warned Illidan to leave Azeroth and never return. After it became clear for Vashj and Kael that they could not destroy the Frozen Throne, they retreated, eventually back to Outland, taking Illidan with them. Note that the in-game animation between Illidan and Arthas was originally planned to be a video cinematic. Time constraints, however, forced the scene to be done inside the game. The developers have said that their greatest regret about this change is that many assumed Illidan died, when the video would have revealed that Illidan survived to watch Arthas' transformation. Illidan at Icecrown Glacier about to fight Arthas. Illidan confronts Arthas at the base of Icecrown Glacier. Illidan lies defeated at the hands of Arthas. Reason: Grammar needs some work. Illidan's demonic form seen in the Burning Crusade opening cinematic. Illidan and his demon hunters. After his fight with Arthas, Illidan fled to the shattered remains of Draenor (now known simply as Outland). Quickly gathering his followers, he soon declared himself Lord of Outland. According to the manual included with the Burning Crusade expansion, Illidan was fully aware that Kil'jaeden had not forgotten his failure to destroy the Frozen Throne. Anticipating the Legion's retaliation, and convinced that another offensive against Azeroth was not far behind, Illidan began to take drastic steps to prepare himself for a defensive stand. Beneath the Black Temple, Illidan began creation of a new fel orc army of his own, using the blood of the imprisoned Magtheridon. As he continued to fortify the temple, his allies worked to ensure that all portals to Outland remained tightly sealed, buying Illidan even more time to strengthen his power base. In order to further cement his authority over Outland and its residents, Illidan ordered Lady Vashj to seize control of the water reserves of the shattered realm. Vashj's naga forces quickly moved to begin draining the lakes and seas of Zangarmarsh, consolidating as much as they could within the Coilfang Reservoir. Eventually Illidan's Naga privatized the Coilfang Reservoir, keeping it under heavy guard and at the expense of the previous denizens of the marsh. Meanwhile, Akama had grown increasingly frustrated over Illidan's refusal to relinquish control of the Black Temple (formerly known to Akama's people as the Temple of Karabor). In addition to his army of fel orcs, Illidan had begun training an army of demon hunters — imbued with the same demonic powers as Illidan himself and wielding warglaives similar to his own. This army would come to be known as the Illidari. Believing that Illidan's work with the fel orcs — whose kin Akama had fought against for so long — and the fel rituals undergone by the Illidari served only to defile the Temple further, Akama began to secretly conspire with Maiev Shadowsong in an attempt to free Outland from Illidan's grasp. It was not long, however, before Illidan discovered Akama's betrayal. Rather than kill the Broken warrior for his treachery, Illidan chose instead to bind a portion of Akama's soul into his service; ensuring that Akama could still be used in the future for Illidan's own purposes. At some point, Illidan led his new army of demon hunters in an assault on a demonic world ruled by the pit lord Azgoth — the first confrontation between the Illidari and the Legion. As he was preparing his troops for the assault, a night elf by the name of Kor'vas Bloodthorn stepped forward, knelt, and openly asked Illidan what made the Illidari — who had demonic energies coursing through their veins and gnawing at their every thought — different from the monsters they fought against. Although some of her comrades chided her for questioning Illidan as he approached the uncertain demon hunter, Illidan opted to remain silent for the time being. With the open portal still raging behind him, and the clock ticking on their assault, Illidan then began rallying the assembled Illidari, proclaiming to them that they would not be guilty of the same mistakes he believed the citizens of Azeroth to be - rather than wait to become bystanders as the Legion washed across one world after another, they would instead go on the offensive, hunting the Legion wherever it lingered before its endless armies had a chance to strike. The demon hunters charged headlong into the portal to Azgoth's domain, easily picking their way past the unaware felguards defending the demonic citadel until they finally burst through the monstrous door to Azgoth's chamber. During the ensuing battle with Azgoth, however, Illidan was wounded by the pit lord's enormous flail. As the annihilan was about to finish the Betrayer, Kor'vas leaped forward and shattered the flail's chain with her warglaive. Barely fazed, the annihilan stunned her with a massive backhand, and trapped her up against a wall with his tusks, taunting the freshly-minted Illidari by preying upon her fears that she might succumb to the demonic forces raging within her. Defiantly, Kor'vas simply sneered and replied "Never", holding the pit lord's attention as Illidan, recovered from Azgoth's blow, launched himself into the air and impaled the pit lord from behind with the Twin Blades of Azzinoth, instantly killing him. Illidan: You wish to know the difference between the demons and us? They will stop at nothing to destroy our world. Kor'vas: ... and we will sacrifice everything to save it. Satisfied with her answer, Illidan gathered up the Illidari, lauding their performance during the battle as they returned triumphantly to their stronghold in Outland. The Illidari charging through the portal to Azgoth's domain. Illidan leading the Illidari in battle. At Illidan's command Akama would ultimately trick Maiev into leading her forces into an ambush, with Maiev being the only survivor. During this attack Illidan would use the souls of the departed - both Maiev's soldiers and his own, including the Ashtongue - in order to open a portal to Nathreza. Illidan and his demon hunters slaughtered Nathreza's defenders, entered the dreadlords' citadel, and breached the archives. After securing the record containing the location of Argus, Illidan destroyed the remaining records and retreated with his demon hunters back to Outland. Once through the portal, Illidan collapsed its spellwork and directed all of the resulting energy - enough to devastate an entire continent - into Nathreza; he believed that if his calculations were correct, the backlash had shattered Nathreza in much the same way that Draenor had been shattered into Outland. It was the single greatest defeat the Legion had suffered in millennia, and the demons who died on Nathreza were slain forever. Illidan comes to give the Dragonmaw their promotion. However, all actions have consequences, and the Legion was now clearly aware of the threat that Illidan posed and would learn from spies from within the Illidari that Illidan planned to launch a similar assault on Argus. Seeking to put an end to Illidan, the Burning Legion decided to attack the forces of Azeroth, and lure them into entering Outland. Once within the shattered realm, the Horde and Alliance would begin striking against both the Legion and the Illidari. Illidan, who had become increasingly obsessed with his mission to destroy Argus would seem to care for nothing else. However, he would become personally involved with the heroes of Azeroth at different occasions such as when they would defeat the Crimson Sigil, where he would challenge them and boast that not even Arthas could stop them. This would seem that Illidan was slipping further into madness (he himself would wonder if he was insane) or that he considered 'defeat' to mean death which would make him technically right. Such nuances of logic are common with Illidan, often employed when defending his actions to others. Illidan would also appear to Azeroth's heroes where he would reveal that the so-called new Highlord of the Dragonmaw was in fact a spy and ordered their death. Though the actions of the nether dragon Yarzill would spare their lives and while the nether dragons were convinced that the Dragonmaw would come to an end from Illidan's wraith, there remained within the Illidari and were one of the defending forces of the Black Temple. Consumed with nothing but his mission to plot the downfall of Argus, Illidan had lost all interest in holding onto Outland. This attitude wouldn't change until the eve of the Black Temple's fall, when Illidan witnessed the flow of the battle and understood at once that this clash of the Legion's enemies was what Kil'jaeden had anticipated. The Betrayer ordered the Illidari Council to retreat and prepare for battle, freshly resolved to both win this battle and finish his own personal strike at the Legion's heart. Illidan, however, was still focused on his larger goal. However, he realized that he did not have enough time to open the portal to Argus with the adventurers coming for him and would need to refocus his efforts elsewhere. To that end, he dispatched a force of his most prominent and powerful demon hunters to the planet Mardum in search of the [Sargerite Keystone], an artifact with the power to open portals to an endless number of demon worlds - even to Argus itself. It was during this time that Illidan would finally take note of the broken leader Akama's absence. Unbeknownst to Illidan, Akama had been working to aid the heroes of Azeroth, and on the eve of the battle, freed Illidan's old nemesis Maiev Shadowsong from captivity. Their combined forces, including notable figures such as Kanrethad Ebonlocke, would then assault the Black Temple. The distraction of this assault was intended to allow a number of champions, along with Akama and his Ashtongue Deathsworn, to slip in, secure the temple, and eventually challenge the Betrayer himself. Although Illidan soon begins to overpower the gathered adventurers, Maiev reappears and makes her move during the battle, releasing the adventurers just as one of Illidan's spells has trapped them, and joining in as the battle resumes. She makes several references to the pain Illidan has caused her, from forcing her to guard his prison for 10,000 years by committing his crimes, to causing the death of Naisha. In the end, when Illidan is near death, Maiev haughtily remarks that he is beaten. As he dies, however, Illidan reminds her that 'the huntress is nothing without the hunt'. Illidan relives his memories, recalling Kur'talos Ravencrest horrified at him sacrificing the Moon Guard for power and Cenarius telling him that the path of a druid requires sacrifice, something which Illidan did not understand. The last thing Illidan sees is Tyrande, whose name he whispers as the lights in his eyes fade. Maiev ordered his corpse to be brought to the Vault of the Wardens on the Broken Isles, determined to force Illidan's undying demon soul to suffer the rest of his sentence for eternity. As the wardens prepared to transport his body, however, the Illidari who had been dispatched to Mardum returned through a portal from their successful mission to retrieve the [Sargerite Keystone]. Learning of their master's fate, the demon hunters attacked, cutting through the briefly-disoriented wardens, until Maiev was able to disable and imprison them by turning the very power they relied on against them. On Maiev's order, the Illidari were transported along with Illidan to the Vault, where she intended to keep them locked away for eternity. After Illidan's defeat, Akama claimed the Black Temple, vowing to fill its halls with light once again. Illidan holding the skull of Gul'dan. Illidan wielding the Warglaives as he prepares to fight the heroes of Azeroth. The Fall of the Betrayer. The fire has gone out. The death of Illidan Stormrage. The duel with Arthas in Wrath of the Lich King. A vision of Illidan appeared as part of the quest  The Hunter and the Prince during a recreation of the duel between Illidan and Arthas Menethil at the gates of Icecrown Citadel. A "memory" of Illidan could be summoned by Argent Confessor Paletress in the Trial of the Champion. In Felwood, adventurers were able to relive Illidan's talk with Arthas, as well as the moment he obtained the Skull of Gul'dan, and finally his battle with Tichondrius, where they would help him against the dreadlord. While visiting the past through the Caverns of Time, he made an appearance in the Well of Eternity dungeon and aided heroes in battle against Mannoroth and Varo'then. In the Pursuing the Black Harvest scenario, it was revealed that Illidan had in his possession an untapped store of raw arcane energy in the Shrine of Lost Souls. With arcane power of that magnitude, he was able to bind many demons to his service by offering them to sate their thirst for magic from that place instead of fel, in exchange for their loyalty. In that way, he was able to gain the support of many demons and freed some of the addiction to fel magic. Kanrethad Ebonlocke believed that this source of power was what Illidan intended to give the blood elves to free them from their addiction, as he had with the demons. But for some reason, possibly knowledge of Kael'thas's betrayal, Illidan never let them near it. After the fall of the Black Temple, the corpse of Illidan was taken by Warden Maiev Shadowsong to the Vault of the Wardens so that Illidan's dark, lingering soul could suffer the rest of his eternal sentence—along with his followers, the feared Illidari. Cordana Felsong led the Gul'dan from an alternate universe to the Vault of the Wardens where Illidan's corpse was being imprisoned, as he was the key to Azeroth's downfall by the Legion. Although confronted by Maiev and several of Illidan's demon hunters freed from their prisons, Cordana and Gul'dan escaped with Illidan's body. Gul'dan brought Illidan's body to Black Rook Hold, where he conducted a ritual to separate his soul from his body. Illidan's soul was then sent into the Twisting Nether. The prime naaru Xe'ra seeks Illidan and believes he is the "child of Light and Shadow" destined to end the age of demons. The remaining Illidari on board the Fel Hammer contacted Illidan's soul within the Twisting Nether, where Illidan revealed that Akama knew his plans to defeat the Burning Legion and tasked the Illidari with convincing him to rejoin their cause, as well as retrieving the [Sargerite Keystone] from wherever the Wardens hid it. Upon being discovered by the demons, Illidan announced that the Illidari would not be able to contact him like this again and named a demon hunter adventurer as their new leader in his place before fleeing his pursuers. Gul'dan sought to use Illidan's body as a vessel for Sargeras' spirit, and so Xe'ra and the Illidari planned to return Illidan's soul to his body before it was too late. Allari the Souleater constructed a soul prism that would store Illidan's soul long enough to transfer him inside [Light's Heart]. However, Illidan's soul had been stolen out of the Nether and pulled into Helheim. Xe'ra and the Illidari speculated that Gul'dan had struck a deal with Helya to retrieve and keep it there. After the death of Helya, his soul was put into the soul prism and then brought to Light's Heart which seemingly consumed it. Light's Heart, with Illidan's soul inside, was brought to Archmage Khadgar with instructions to call forth the vessel's power when Gul'dan attempts to open the portal for Sargeras in order to release Illidan's soul into his body. Within the Nighthold, Khadgar attempts to do as he was instructed. But unbeknownst to Khadgar, Sargeras has already filled Illidan's empty shell, and doing so awakens him. The adventurers then battle The Demon Within. After Sargeras is defeated, Illidan takes control of his body and kills Gul'dan the same way Gul'dan killed Varian Wrynn, ripping him apart with fel energy until only his skull remains. He then crushes it with his hand and turns to the assembled fighters, telling them that now they know what they face, they should follow him into the abyss. Illidan arrives late to the second battle at the Broken Shore, prompting Maiev to snark that her wardens are doing all the work while his demon hunters play with their felbats, before Prophet Velen tells both of them to stop arguing. Illidan and Maiev work together to travel to the top of the Cathedral of Eternal Night and use the [Aegis of Aggramar] there. They bicker throughout the dungeon, and Illidan aids in the defeat of Mephistroth. After Mephistroth's defeat and the activation of the Aegis, an echo of Aegwynn, the Guardian of Tirisfal who created the Tomb of Sargeras, appears and reveals that said echo was placed there by Aegwynn in case the wards on the tomb failed. She explains that the Pillars of Creation can restore her wards and that the Eye of Aman'thul can destroy the felstorm. In the tomb itself, Illidan explains that few understood his use of the naga to obtain the Eye of Sargeras, but was a necessary tactic to secure the future of Azeroth. As the class order hall leaders return to the main floor of the ruins, Khadgar remarks to his mentor's mother (a projection of her) that they will find Kil'jaeden and put an end to his plans and this time they won't fail. Illidan said it was a bold claim, but added that victory requires more than courage alone. Illidan elaborated that the armies of the Alliance and Horde had many moments of courage yet ultimately, their armies ended up slaughtered during the Battle for the Broken Shore. Illidan warned that the Deceiver will manipulate everyone's fears and doubts and use it against them. Argus visible in the sky above Azsuna. While adventurers battled the Fallen Avatar, Illidan, Khadgar, and Velen faced Kil'jaeden. When Kil'jaeden retreated to his Legion ship, Velen rushed through his portal in pursuit as Khadgar tried to stop him. Illidan encouraged Velen's initiative and tells Archmage Khadgar that sealing the portal alone would be futile. Whether it took years or even a millennia, the Legion would eventually return as many times as they are able. They must make use of this opportunity to seize their fate and use the portal to follow Kil'jaeden into the Twisting Nether; for it was the only way to kill a demon. If they fall, they will take the Deceiver with them. Upon Kil'jaeden's death, his ship began to crash on Argus. Illidan used the Sargerite Keystone to open a rift between Argus and Azeroth, allowing Khadgar to teleport them safely to Azsuna. Upon their return to Azeroth however, it was revealed that Illidan had left the rift from Azeroth to Argus open, and Argus became visible on Azeroth's sky. Khadgar, horrified, asked Illidan what he had done, and Illidan responded that sometimes the hand of fate must be forced. He also defended the Broken Isles against the Legion Assaults, directing class order champions. Illidan traveled to the Exodar on Azuremyst Isle in order to board the Vindicaar, a new dimensional ship the draenei created to go to Argus. Once there, Illidan confronted Velen about his faith; how he had allowed Sargeras to corrupt Archimonde and Kil'jaeden, and allowed the Legion to take Argus, and through it all did nothing, all the time believing he was following the Light's will. When Illidan told Velen that his people's blood was on his hands, Velen snapped that Illidan would never understand what he did to save his people, to which Illidan replied that the Light was holding him back and Velen should forge his own path. At this time, Grand Artificer Romuul arrived and told Velen that the Vindicaar was ready for its trip to Argus. After arriving above Krokuun, Illidan was at first dismissive of the Army of the Light as they were nowhere to be found. When the Xenedar appeared soon after the Vindicaar's arrival, it was quickly shot down by the Burning Legion and Azeroth's forces rallied to begin the final battle for Argus. During the initial push onto Argus, Illidan helped bring down the Antaen Light-Breaker that had shot down the Xenedar and warned Velen to be wary of the local Broken's loyalties. Xe'ra begins to forcefully fill Illidan with the Light. When Xe'ra, restored through the efforts of Turalyon, Alleria Windrunner, and an adventurer, attempted to fulfill the destiny she had seen for Illidan through the Light, Illidan rejected her. Illidan stated that he had traded his freedom for power before. As the two got into an argument about Illidan embracing the Light and whether his destiny was his own, Xe'ra even bound Illidan in chains of light to force the prophecy to be fulfilled and forge Illidan a new life. Stating that his life was not hers to take, Illidan ultimately broke free, declared his destiny is his own, and killed Xe'ra. Horrified, Turalyon cried that Illidan had doomed them all, called him Betrayer, and attempted to strike him down with the Great Royal Sword. Illidan blocked Turalyon's blow with his hand, telling him as fel blood leaked down his arm that his faith had blinded him and there was no chosen one--only they could save themselves. Illidan and the Illidari set up a base at the Veiled Den in the Antoran Wastes, north of the Army of the Light's base at Hope's Landing. When asked by Turalyon about the situation, Illidan reported that a direct assault on Antorus, the Burning Throne would be folly due to the Legion's numbers and the unnatural speed with which they replaced fallen demons; some were even strong enough to slow him down, slightly. Breaching the stronghold would require a different plan, and in the meantime he had a sea of demons to slay. Illidan and the imprisoned Sargeras. Within Antorus, Sargeras left his pets to do some playtime. Illidan tells the heroes to eliminate them for they are one of many more demons to die by their hand. Upon reaching to the Broken Cliffs, he says that striking at the heart of the Legion is futile until we take out their war machines. Unchecked, they will soon overwhelm us. After killing Kin'garoth, Illidan remarks that the Legion is in its death throes. He then tells the heroes to report back to the Vinicaar to go into the heart of Antorus. At the heart of the Legion's stronghold, the Coven of Shivarra are torturing the Pantheon (excluding Eonar and Aggramar). Magni can feel the demons twisting the spirits of them; forcing them to use their might to serve the Legion. Should they fall into darkness, Illidan says, Sargeras will have the power he needs to claim the final titan Azeroth. After Aggramar is defeated and his soul returns to the rest of his brethren, Illidan reminds everyone (Magni included) that our victories mean nothing. So long as Sargeras has the soul of Argus to fuel his infinite army, Azeroth remains in grave peril. After Argus the Unmaker is defeated, the heroes of Azeroth return home while the Pantheon prepares to imprison Sargeras. Illidan, however, stays behind at the Seat of the Pantheon, saying that the hunter is nothing without the hunt. While Sargeras manages to strike Azeroth in Silithus, gravely wounding her, the Pantheon pulls him back and imprisons him at the Seat, appointing Illidan as his jailor. Before he left for Antorus, Illidan created a crystal with messages for Malfurion, Tyrande, and the adventurer. After the events at the Seat of the Pantheon, the crystal was found aboard the Vindicaar and delivered to its recipients. To Malfurion, he spoke of how the teachings of Cenarius were not for him as they were for his brother, and how all the power he sought was not to conquer or rule, but to save Azeroth, despite Malfurion's distrust--though Illidan admitted he did not make it easy for Malfurion to do so. With his fate becoming clear, Illidan wished to finally quiet the strife that had long divided them and entrust the safety of the world to his brother, for there was no one he trusted to face threats more than him. While Malfurion had spent a lifetime fighting for the dream of what Azeroth could be, he now must fight for what it is. With his final words, Illidan asked Malfurion to take care of Tyrande and listen to her counsel, for she was always the best of them. The road ahead would be long, but whatever came, he knew Malfurion would bring honor to the name Stormrage. To Tyrande, he spoke of how all the paths he had taken had led to a single purpose, saving the world; he could bide no half measures or compromises. He told her how whenever he faced doubt, he held on to one anchor: Her. He told Tyrande that she embodied the best of Azeroth with her faith and devotion, and asked her to take care of Malfurion. While he sometimes wished her heart had made a different choice, in the end he knew she made the right one. Atop Hyjal, on the shores of the Well of Eternity that he created ages ago, Illidan told the adventurer that they had proven their commitment to Azeroth, that their dedication and sacrifice rivaled his own. With enemies gathering and shadows growing darker, the defense of the world rested with them. The relationship between the Stormrage brothers is noticeably different in Warcraft III/The Frozen Throne and in the War of the Ancients Trilogy. By way of comparison, in the novels written by Knaak, Malfurion is more tolerant and forgiving of his brother, who is portrayed as often selfish, reckless, out of control and not completely sane. Rather than becoming part of the "lynch mob" who want Illidan summarily executed, Malfurion speaks on his behalf, endorsing his knowledge of the Burning Legion as vital tactical information... giving an undeniable reason to bury Illidan rather than kill him. When we first were introduced to Malfurion and Illidan in Warcraft III, Malfurion objected fiercely to the idea of freeing Illidan, in the belief that his crimes were unforgivable and that he should stay locked up. When they were reunited Illidan was bitter about how he had been punished and Malfurion was disgusted to be in the same room as Illidan, still nursing a grudge over Illidan's betrayal. Illidan, who seemed to be the more forgiving one at the time, was eager to prove to his brother that the demons had no hold over him. Later, after Illidan used the powers of the Skull of Gul'dan for himself and took on a demonic appearance, Malfurion demanded to know where his brother was, implying he still had some affection for him. After Illidan revealed that he was the demon, Malfurion, rather than killing him simply banished him. Obviously, Malfurion knew Maiev Shadowsong would want Illidan imprisoned but still chose not to act. Rather than object, Illidan simply walked away. Illidan was next seen in Warcraft III: Frozen Throne. After the two worked together to save Tyrande, Illidan seemed to have forgiven Malfurion for disrupting his attempt to destroy the Frozen Throne, even though it would leave him at Kil'jaeden's mercy. Malfurion's last words to Illidan included an ominous threat about what would happen to him if he ever did anything against the kaldorei again. This too, Illidan accepted without objection. Illidan admitted that he had known only "ages of hate" for his brother, but for his part he wished it to end. This is perhaps the closest thing to a peace that the brothers have achieved. Illidan then departed telling Malfurion he doubted they would ever see each other again. In World of Warcraft, Malfurion's words indicate that he does not wish to fight his brother, and he says that if he is forced to, things will not be as they were at the Well at Zin-Azshari. 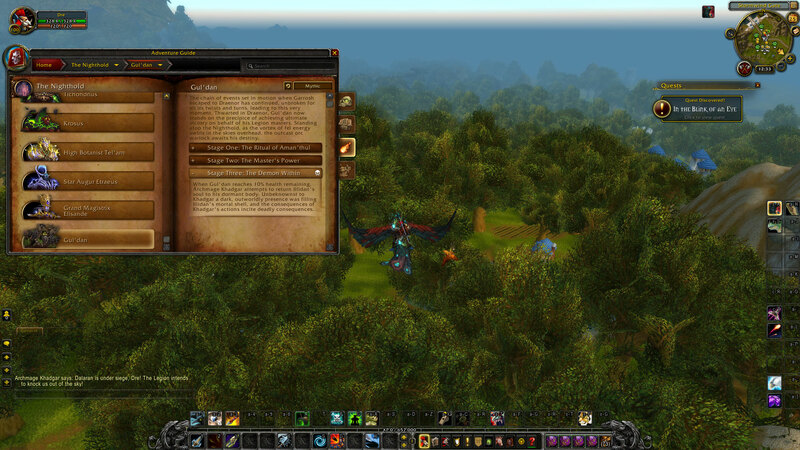 According to Seeds of Faith, Malfurion is saddened by Illidan's death in Outland. Malfurion Stormrage says: Cenarius fights at my side. Illidan sits atop his throne in Outland – brooding. I'm afraid that the loss to Arthas proved to be his breaking point. Madness has embraced him, Remulos. He replays the events in his mind a thousand times per day, but in his mind, he is the victor and Arthas is utterly defeated. He is too far gone, old friend. I fear that the time may soon come that our bond is tested and it will not be as it was at the Well in Zin-Azshari. The exact meaning and implications of this are not known. It is however likely that Malfurion fears that the bonds between him and his brother Illidan will be tested in the near future. For 10,000 years ago, during the War of the Ancients, the two brothers were forced to work together to throw back the Burning Legion at The Sundering, which is when they chose their separate paths. Lady Vashj and her naga were sent by Azshara to establish contact with Illidan. Illidan was listed as a sorcerer, rogue and fighter in the original Warcraft RPG, which used 3rd Edition Dungeons & Dragons classes. This was changed to a mage and warrior in the World of Warcraft RPG, which uses the classes seen in-game. Illidan acquired Nature's Ring, a powerful druidic ring, as a gift from his brother Malfurion long ago, before their rivalry. He also wields the [Gauntlets of Might] and the Girdle of the Betrayer. Illidan gave Kael'thas a black plate armor. Before his debut in The Burning Crusade, the Manual of Monsters confirmed that Illidan survived his encounter with Arthas near the Frozen Throne and was forced to exile in Outland. "V-vampiric in nature, my lord. Some animals drink blood, but this one seeks magical energy." "I come to offer my services to my queen... and to the lord of the Legion!" "Well? Come with me... if you'd like to live long enough to see me save this world!" "Aye. It's been twisted and turned by too many spells. The fuss we - especially you - made with the portal was too much! The same spell that sent the Burning Legion back into their foul realm now works on the well! It's devouring itself and taking its surroundings with it! Fascinating, isn't it? "If you've a way out of here, we should probably use it! I've tried casting myself and Tyrande out of here, but the well is too much in flux! "If only I could learn from them. For unit quotes, see Quotes of Warcraft III/Night Elf Sentinels#Illidan Stormrage. "Because I once cared for you, Tyrande, I will help you hunt down the demons. But I will never owe our people anything!" "You reek of death, human. You'll regret approaching me." "Now at least the demons will no longer corrupt the forests. But, if I destroy the skull and claim its powers as my own, I will become even stronger than any of Archimonde's lieutenants." "Betrayer... in truth, it was I who was betrayed. Still, I am hunted. Still, I am hated. Now, my blind eyes can see what others cannot. That sometimes the hand of fate must be forced!" "Isolation can do that to the mind. Now, after all the long centuries you kept me chained in darkness, it is only fitting that I bury you in turn." "Whatever I may be - whatever I may become in this world - know that I will always look out for you, Tyrande." "We have had much strife between us, my brother. I have known only ages of hate for you. But, for my part, I wish it to end. From this day forward, let there be peace between us." "There is no cure, young one. But there are ways to feed the hunger. Follow me, and I will grant your people more magic than they can imagine." "Hear me now, you trembling mortals! I am your lord and master! Illidan reigns supreme!" "Perhaps hiding here was not the most prudent decision." "Then the hour has come at last. After today, the Scourge will meet its end! Can you hear me out there, Arthas? Its end!" A group of Illidari demon hunters, with Kor'vas Bloodthorn front and center, stands assembled for battle as rain pours down around them. Illidan Stormrage: You were not prepared. Illidan stands atop a portal, channeling magic in his hands. Illidan Stormrage: The enemy came into our world, their only desire to extinguish all life. A flashback of Kor'vas during a demon attack in her home city. Illidan Stormrage: They slaughtered our loved ones. They razed our homes, our cities, and our sacred places. You tried to stop them... and you failed. Flashback to Kor'vas, kneeling next to the slaughtered corpses of her family, then shifting forward to her initiation as a demon hunter, her eyes burning with felfire. Illidan Stormrage: And so, you came to me, nothing remaining of you but rage and determination, and you learned that the things that once tormented you could give you power. Kor'vas stabs a pair of blades into her eyes, ritually blinding herself to gain the spectral sight; the scene returns to the present. Illidan Stormrage: Now you see that there is no sacrifice too great if it brings an end to the Burning Legion. Illidan unleashes the magic in his hands, activating the portal he is standing on. Kor'vas kneels; Illidan's burned-out eye sockets glow behind his blindfold as he looks to her. Kor'vas Bloodthorn: Demonic energies course through our veins. They gnaw at our every thought. Kor'vas looks up at Illidan. Kor'vas Bloodthorn: What makes us any different from the monsters we fight? Illidari Demon Hunter: You question the Master? Illidan smiles as his wings spread wide, casting a shadow over his assembled followers, before he leaps to the ground. Illidan Stormrage: We will not sit idly like those on Azeroth, waiting to become the demons' prey! We will take this war to the Legion's worlds... and prey upon THEM! The demon hunters cheer as they follow Illidan through the portal. On the other side, they begin cutting through the felguards around a great Legion fortress, before Illidan kicks the doors in, confronting the world's master - the annihilan Azgoth. Azgoth: Ahh, demon hunters... you dare attack the Doom Lord Azgoth in his own domain? The demon hunters charge at Azgoth and his guards. Kor'vas cuts through a number of felguards, then looks up at Illidan, who is glowing with felfire; he slashes through attacking felbats with ease, and blasts Azgoth with an [Eye Beam]. Azgoth swings his massive flail at Illidan, sending him flying through a stone pillar before collapsing to the floor. Azgoth laughs. Azgoth: Your mission has failed. Your cause dies with him! Azgoth raises his flail to strike down Illidan; screaming in rage, Kor'vas charges, slicing through the flail's chain. Azgoth growls and backhands Kor'vas, pinning her against the wall between the great horns on his head. Azgoth: You smell more of demon than hunter. You would serve us well. The burning fel orbs in Kor'vas' eye sockets are visible as she glares defiantly at the demon. From behind, Illidan leaps up and charges into Azgoth, tearing through his back and into his chest with the Twin Blades of Azzinoth. With a scream, Azgoth explodes in a burst of felfire. When it clears, Illidan stands among the smoldering bones of the pit lord, and picks up Kor'vas' warglaive before approaching her. Illidan Stormrage: You wish to know the difference between the demons and us? They will stop at nothing to destroy our world. Kor'vas Bloodthorn: And we will sacrifice everything to save it. Illidan smiles and hands Kor'vas her weapon, then leaps atop the ruin that was once Azgoth. Illidan Stormrage: The Legion will know of this victory, and they will fear you, my Illidari. Illidan raises one of his blades high. Illidan Stormrage: Now... you ARE prepared! The hour has come at last. The Legion will stop at nothing to destroy our world. The Legion's fury pales before mine. You are not... (sigh) prepared. Your persistence is hardly surprising. I will not be touched by rabble such as you! YOU ARE NOT PRE- oh, what's that? Am I denying you something? Ha! You know nothing of true longing. I will finish my hunt. I will see this to the end. The Legion will meet its end. There is no sacrifice too great. Gul'dan has been vanquished, but his master Kil'jaeden poses an even greater threat. The Deceiver will stop at nothing to destroy our world. We must make any sacrifice necessary to end his reign. "War is deception... a game played best from the shadows." In The Burning Crusade, Illidan was depicted as a mad, insane tyrant and had been made into an antagonist without much development, leading to many fans' uproar. Blizzard expressed their desire to fix their portrayal of Illidan. Many years later the Illidan novel and Legion retroactively added to his evolution and explained his behavior. Previous lore stated that Sargeras burned arcane tattoos onto Illidan's skin. World of Warcraft: Chronicle Volume 3 retconned them into fel tattoos. Before World of Warcraft: Chronicle Volume 3, it was stated that Vashj and many others remembered Illidan, who had become infamous before the Great Sundering. The naga respected his power, particularly now that Illidan had become a demon, and they agreed to serve him. He has been referred to as the lord of shadow. According to the Illidan novel, Illidan once saw a naaru in the Terrace of Light in Shattrath. Since first brought up at BlizzCon 2010, Illidan had been a popular candidate for revival and redemption. This culminated in his story during World of Warcraft: Legion. Illidan appeared in nearly every campaign within Warcraft III: The Frozen Throne, with The Founding of Durotar being the sole exception. The Illidan's Task mission refers to him as the former demon hunter. He never stopped being one. According to the Heroes and Villains section of the Warcraft III manual, Malfurion and Illidan were 15,032 years old as of the Third War in Year 20. Since The Burning Crusade took place in Year 26, this would mean he died when he was 15,038. The Sundering states Malfurion was only a few decades old during the War of the Ancients that occurred in Year 10,000 BDP. Because they were twins, Illidan would be the same age. The Warcraft Encyclopedia states Malfurion and Illidan grew up with Tyrande millennia before the Great Sundering, reinforcing the Warcraft III account. However, Chronicle Volume 1 instead establishes that the dark trolls first began to settle around the Well of Eternity around the year 15,000 BDP, with Malfurion being described as a young night elf at the start of the War of the Ancients 5,000 years later. If you look closely at Illidan in Warcraft III, you will notice that at least one of his blades has the face of a panda painted on it (Samwise Didier's trademark). One place it can be seen clearly is when Illidan says goodbye to Tyrande and Malfurion. When Illidan is transformed by the Skull of Gul'dan, the face on his blades changes from a happy panda to an angry panda. In Warcraft III: The Frozen Throne, after growing demonic horns, wings, and hooves, Illidan left flaming tracks on the ground. He also gained the ability to walk across water (leaving steam as he passed instead). Because the interlude in The Frozen Throne shows Illidan as a normal night elf when he made a deal with Kil'jaeden, it is often presumed that Illidan's new appearance (with horns, wings, and hooves) was a result of Kil'jaeden's further empowerment. It should be noted, however, that most sources, including the Warcraft Encyclopedia, only mention his demonic transformation when discussing the Skull of Gul'dan; no mention is made of further transformation during his meeting with Kil'jaeden. Although Malfurion said Illidan's transformation by the Skull of Gul'dan had cost him his soul, there has so far been no evidence that this claim was anything more than hyperbole. It is likely Malfurion was merely shocked at seeing Illidan in demonic form and was speaking metaphorically. There is no evidence that Illidan's personality has drastically changed as a result. Until it is established, the possibility remains that the only change in Illidan seems to be slight insanity (though after reading the War of the Ancients Trilogy, one is forced to wonder if Illidan was not insane before he consumed the Skull of Gul'dan). At some point, Illidan tried his hand at writing, authoring a book entitled [The Emerald Dream]. The actual book itself starts a level 54 Druid quest. It's doubtful the text was well-received among the Cenarion Circle or the green dragonflight. Note that all of the Dire Maul books have silly names and/or flavor text ( [The Arcanist's Cookbook], the mage book, being a good example of this). At release, when there was no high level content, it was announced by Ordinn that "the most powerful NPC is Illidan." When asked where he was, Caydiem responded. "Illidan is shy." When the player rescues Illidan in Outland during the Blood Elf Campaign, Lady Vashj says that the blood elves are the descendants of the Highborne who served Illidan years ago. Curiously, Illidan himself never actually commanded any Highborne in the War of the Ancients (either version). Illidan is one of the few characters in-game to be shown wielding an obtainable legendary weapon. Others include Ragnaros, Medivh, Halduron Brightwing and Nik the Mountain. It is said that Illidan contributed to the creation of the Moonwells. Inspiration for Illidan came from early concept art of Uther the Lightbringer. In the original drafts for Warcraft III, Illidan was still Furion's brother, but had been turned into a satyr due to his dabbling in magic — a take on how the Greek god Pan is depicted in Shakespearean works. This version of the character "felt really weak", so Chris Metzen took it back to the drawing board and changed it to what is seen in the final version of the game. Illidan alongside Tyrande acts Malfurion's nightmare during Stormrage. In this nightmare Tyrande chose him instead of Malfurion, thus the priestess turned into a demon. He appears as a legendary card in Hearthstone. His flavor text reads: "Illidan's brother, Malfurion, imprisoned him beneath Hyjal for 10,000 years. Stormrages are not good at letting go of grudges." He is also the sixth and final boss that new players face in the game's intial tutorial. IIlidan is a playable character in Heroes of the Storm. One of his skins, "Shan'do Illidan", depicts an alternate reality in which Malfurion became the Betrayer, Illidan became Archdruid and Tyrande became a Warden. The skin's description reads "Stormrage was born with amber eyes; a sign of great destiny... But as he learned from Cenarius, his brother grew distant. Still, none expected Malfurion's betrayal." When doing the Well of Eternity instance and killing Peroth'arn, if you have the Warglaives of Azzinoth equipped Illidan will say "Curious weapons you wield... such power" followed by "You seem prepared". [Illidan's Coin] can be fished up from the fountain in the Legion version of Dalaran. Illidan is the narrator of the World of Warcraft: The Burning Crusade cinematic. Betrayer Regalia, the warlock Mists of Pandaria Challenge Mode set, is themed after Illidan. Illidan was voiced by Matthew Yang King in Warcraft III: Reign of Chaos, Warcraft III: The Frozen Throne and the Black Temple Gameplay Trailer. He is now voiced by Liam O'Brien in World of Warcraft: The Burning Crusade, World of Warcraft: Cataclysm, Heroes of the Storm, and World of Warcraft: Legion. An Illidan vinyl statue is available. [Murkidan] was given out as a reward to BlizzCon 2015 attendees. Illidan's wings are available to Diablo III players as a vanity item for those who order the digital or collector's edition of Legion. Illidan is an alchemist and can identify individual components in alchemical mixtures. Illidan in the Well of Eternity instance. Illidan's body was described as already having demonic features before he was transformed by the Skull of Gul'dan. This probably referred to his demonic eyes and fel tattoos. In the Well of Eternity dungeon, he had long, dark claws on his hands and feet, though these were never seen or referenced anywhere else. After being resurrected in the Nighthold, Illidan can be seen with the Twin Blades of Azzinoth. When he appears again during the assault on Broken Shore and in the Cathedral of Eternal Night however, he uses a variant of the Twinblades of the Deceiver skin instead. The key art for patch 7.2 features him with the Twin Blades of Azzinoth again, so it is unclear which weapons he is meant to have wielded canonically at the time. During his time on Argus, all the way up to the ending cinematic for Antorus, the Burning Throne, he is once again seen with the variant warglaives. In the Well of Eternity dungeon he used the original two GM items [Warglaive of Azzinoth (Left)] and [Warglaive of Azzinoth (Right)]. Illidan doesn't like murlocs, nor does he understand why some people do. Illidan was the Chosen One in the naaru Xe'ra's prophecy. Illidan's inner demon may have been Azzinoth, the doomguard he stole the Warglaives of Azzinoth from. He may have ingested the demon's blood and heart to bond Azzinoth's soul to his, in the same way he made Illidari trainees do that with demons at the Black Temple. The Soul Fragment of Azzinoth spawned during Mythic Gul'dan in the Nighthold could support this idea, though they could also be spawned from the Twinblades of Azzinoth, like the Flames of Azzinoth were. Another possibility that has been suggested is that Sargeras put a piece of his own soul into Illidan when he gave him spectral sight and tattoos, in a manner similar to when part of his soul was inside Aegwynn and Medivh, and that this piece of Sargeras is Illidan's inner demon. That the NPC for Sargeras possessing Illidan in the Nighthold is named The Demon Within could support this idea. It may also be an amalgam of all the demon souls Illidan absorbed over the years. Since he has become a demon himself, it is unknown how the two souls would react, or what would happen to either of them upon death. Magtheridon confronted by the Illidari in Warcraft III. Illidan using "Eye Blast", by Daarken. Illidan on the official World of Warcraft: Legion wallpaper. Cover artwork for World of Warcraft: Illidan. Illidan as seen in a quest retelling the events of Felwood. A sculpture of Illidan seen at E3. The statue is now in Blizzard's main lobby. DC Unlimited's Illidan action figure. "Legacy of Stormrage" in the TCG. Illidan's new model as shown on the Legion website. On the BlizzCon 2015 wallpaper. Illidan and Akama in front of Black Temple. Patch 7.2.0 art by Glenn Rane. The warglaives Illidan sometimes wields in patch 7.2. Illidan on the unreleased board game, Scion of Darkness. Illidan artwork from Heroes of the Storm. Eredar Armor Illidan (formerly Master Illidan). Illidan in Metamorphosis form (as shown in the hero trailer for Leoric). Illidan Stormrage in a crossover. ^ a b "Terror of the Tides: Rise of the Naga", Warcraft III: The Frozen Throne. Blizzard Entertainment. ^ Akama says: "The Light will fill these dismal halls once again. I swear it." ^ Ultimate Visual Guide, pg. 53 - "Along with his new sight, Sargeras gifted Illidan with arcane tattoos that enshrouded both of his shoulders, permeating the night elf with Sargeras' dark magic"
^ The Warcraft Encyclopedia/Illidan Stormrage - "As further reward, Sargeras marked much of Illidan's body with an intricate pattern of tattoos that filled the night elf with powerful arcane energy." ^ World of Warcraft: Chronicle Volume 3, pg. 69 - His eyes were burned out and replaced with smoldering pits of magic, and his skin was scarred with fel tattoos. ^ World of Warcraft Battle Chest Guide, page 153. ^ Pretzel Lectern: Behind WarCraft III: An Interview with Campaign Designer David Fried (2016-05-25). Retrieved on 2016-06-24. ^ Illidan Stormrage (tactics): Illidan Stormrage yells: Behold the power... of the demon within! This page was last edited on 4 March 2019, at 20:34.